Product #21510 | SKU ML300L-S2016 | 0.0 (no ratings yet) Thanks for your rating! 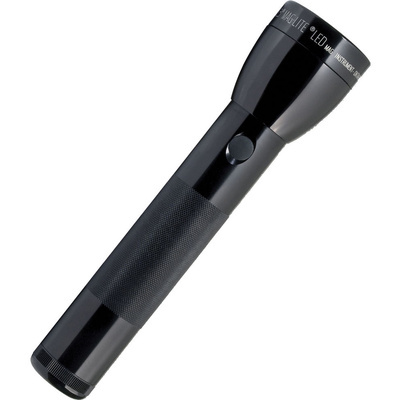 The black LED 3 Generation 2-Cell D Flashlight from Maglite is a focusable white LED light featuring 524 lumen maximum output, several power and lighting modes, and a water and impact resistant aluminium housing. The flashlight provides a momentary and constant-on operation, high, low, eco, and strobe output modes. The high output mode flashlight delivers 524 lumens of light for 6.5 hours, the low output delivers 143 lumen for 20 hours, and eco mode delivers 58 lumens for 69 hours. You can also change the sequence of these modes by setting the flashlight to general, outdoor, law enforcement, and military priority settings. The activation and switching between the modes are performed via a pushbutton located on the side of the body. Quick-Click switching allows changing between output mode sequences. The flood-to-spot quick focusing is performed by twisting the head in 1/4 of a turn. The housing with black finish is water resistant, impact resistant to 1 m, and has a textured handle and tailcap for a secure non-slip grip.